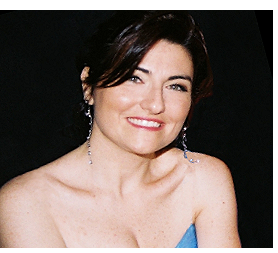 Born in Bologna, Italy, Scilla Cristiano began her career whilst very young, appearing in Henze’s Pollicino and Mozart’s Die Zauberflöte at Bologna’s Teatro Comunale. Studying both piano and voice, she subsequently completed her degree with first-class honours at the Conservatoire G.B. Martini in Bologna. She went on to expand her repertory, studying with such teachers as Gloria Banditelli, William Matteuzzi, Ildebrando D’Arcangelo, Claudio Desderi, Giulio Liguori, Anna Di Gennaro and Leone Magiera. She also attended the Accademia Rossiniana in Pesaro and the High Specialization Academy of the Festival Pucciano at Torre del Lago. Scilla Cristiano was prizewinner of several international singing competitions and gave a recital at the ceremony to award Joan Sutherland The Pagliughi La Siòla D’Oro, before the great Australian soprano and her husband Richard Bonynge. Haydn STABAT MATER - Bologna Cattedrale; Mozart EXULTATE JUBILATE KV 165 - Isernia Cattedrale; Mozart MISSA BREVIS KV 275 - Reggio Emilia; Mozart REQUIEM KV 626 – Ravenna Sant’Apollinare in Classe, Ferrara Certosa, Udine Duomo, Academic Glinka Capella St. Petersburg; Mozart VESPRAE SOLENNES DE CONFESSORE KV 339 - Isernia Duomo; Orff CARMINA BURANA – Firenze Giardini di Boboli, Siena Abbazia di San Galgano; Pergolesi STABAT MATER – Bologna Basilica di San Francesco; Rossini PETITE MESSE SOLENNELLE - Reggio Emilia; OPEN-AIR CONCERT with Deutsche Radio Philharmonie Saarbrücken Kaiserslautern - Losheim am See; HOMMAGE À MARIA CALLAS for Académie Lyrique des Pays-de-Loire - Théâtre de Laval; OPERA CONCERT at Suntory Hall, Tokyo. Riccardo Chailly; Oliver Diaz; Giuseppe Finzi; Valerio Galli; Simon Gaudenz; Gustav Kuhn; Leone Magiera; Bruno Nicoli; Francesco Ommassini; Kazushi Ono; Renato Palumbo; Daniel Raiskin; Donato Renzetti; Aldo Salvagno; Massimo Taddia, Hirofumi Yoshida; Massimo Zanetti. Lorenzo Arruga; Renato Bonajuto; Filippo Crivelli; Giancarlo Del Monaco; Francesco Esposito; Pierfrancesco Maestrini; Stefano Monti; Paolo Panizza; Alessio Pizzech; Aldo Tarabella; Paola Viano; Stefano Vizioli.